The Detoxifier is a 75 minute signature massage at Zama that infuses Swedish relaxation or deep tissue massage with the ancient healing powers of cupping. Cupping, an ancient Taoist medical practice that dates back to the year 281 AD, is good for drawing out inflammation. Read more about the history of cupping. Check out our article on the many benefits of cupping here. 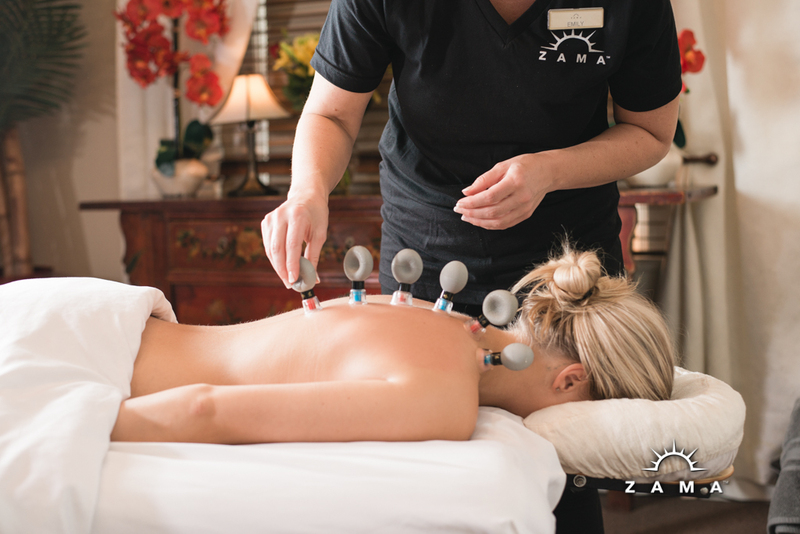 At Zama, silicone and magnetic cups are used by our massage therapists to increase local blood supply to the muscles. Using cupping, the Detoxifier Massage brings nourishment to the tissues and allows for toxins to be carried away via the lymph. Magnetic cups make it easy for massage therapists to re-balance tissue polarity and counteract inflammation and pain. Chronic and acute pain can be relieved with minimal discomfort. Tense muscles are softened quickly and easily using the silicone cups. Combining cups with the healing power of touch, the Detoxifier Massage can have a sedating effect. This massage is deeply relaxing and good for flushing out stagnant energy, pain, and inflammation in your muscular tissue. Recommended for injuries, desk workers, and chronic pain. The Detoxifier is recommended for anyone who sits at a desk and has a lot of neck, upper back, shoulder, or low back discomfort. It is also great for anyone who has an old injury that needs some attention.